For these nails I started out with OPI Funky Dunky as a base on all but the index finger, which is Sally Hansen Xtreme White On. For the base of the Willie the Wildcat head I was going to use Zoya Kelly, but it was a bit dark - so it is a mix of Zoya Kelly and Zoya Casey. The lighter fur is Zoya Casey. The eyes were done with a dotting tool. The "KSU" on the index was done with Casey and Funky Dunky, and the football with OPI Cheyenne Pepper. Stamping done with Konad plate m57, Konad white, and Zoya Casey to fill in some spots. This is my second attempt at freehand, and I think it turns out pretty well. The animal (hopefully) looks a bit more like what I was initially intending - a wildcat - and not an otter. One thing I have learned from my experience with freehand nail art is that I am definitely not ambidextrous. 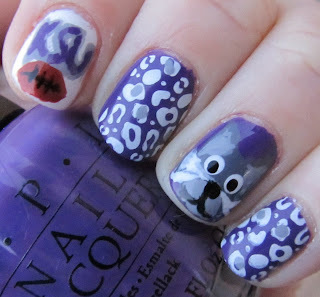 For now I will spare you the small sad kitty and deflated football on my right hand, haha. Hopefully I will get better in time. I am so impressed by all of you ladies who are so good at freehand, it is tough! I am having fun learning though. Mini Haul and Last Day For Giveaway! OPI Muppets Collection - The Glitters! OPI Muppets Collection - The Shimmers! My New Year's Eve Polish - A Long Time Lemming! New Polish for a New Year Giveaway!